I have to start with a disclaimer. We haven’t raised any parrots from babies before. We are learning as we go. We just spent some time talking to a lady who runs a pet shop in Humble, Tx. She said that we would be able to tell the birds were ready to wean when the gray had been replaced by feathers. As you can see, the gray is still poking through the feathers on Kiwi’s back but not so much on Skittles. She is two weeks older. This picture is from about 25 January. This article spans about two weeks with us learning along with the babies. We spent some time researching on line and learned what a weaning cage should look like. This is not it. This cage is what we have been using since the adoption. We felt the walls were high enough to contain these two critters and things had been working well. With hand feeding we found that they managed to potty quite regularly and well. This arrangement allowed us a quick change of chips when our potty alarm (Sally’s acute sense of smell) sounded. 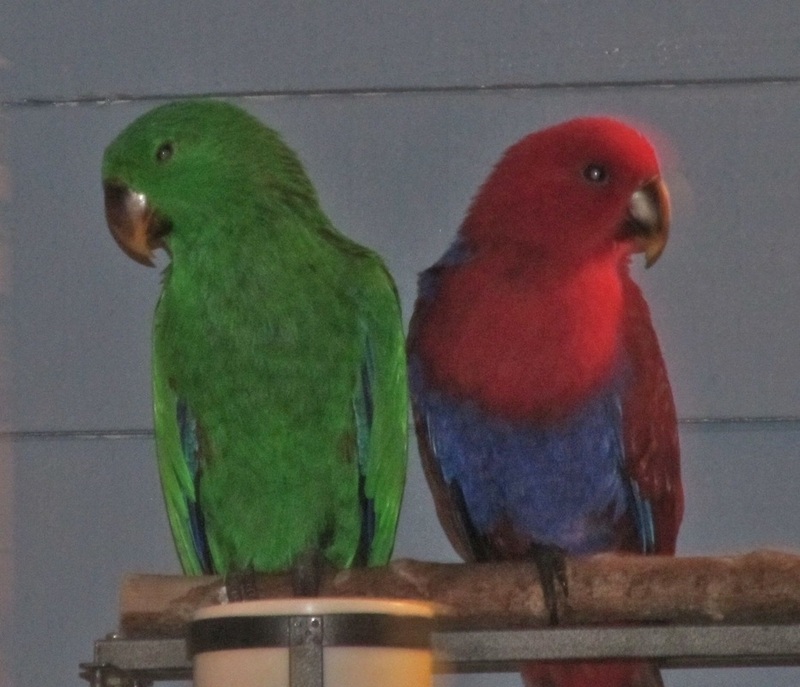 Then the other night we heard some loud squawks from the cage. Our girl skittles had climbed over the side of the green tub and wedged herself between the tub and the cage. We knew it was time to change cages. Cutting outside distractions to a minimum is key here. Now skittles plays with her food. It is our impression that Kiwi just watches. We were told it was best to separate them so we would know for sure just who was doing what. The only trouble is that they really do not want to be separated. I think when they are older they will. After about two weeks they began to really cut down on their baby food. Sally has found that they really like quinoa and chayote. We are going to try to grow as much of their food as possible. I really like chayote too. I have no idea how to grow quinoa. We also found that they like the Pellets that are available. We think the hard part of the weaning has now been done. If you don't see a change in these kids, just take a look at one of the older pictures. Lettie is the one we go to for advice on dogs. She's pretty good on birds as well. She was just visiting though and liked the babies. I thought she was going to try to take them. I am actually going to just post a batch of recent pictures now. If you want me to post something more recent just send a message to Lee Wilcox on Facebook. Just like a proud papa I am happy to show pictures. Skittles did not like this toy. So - she attacked it. Glad she wasn't upset with me. Kiwi is tired of this nonsense. Quiet woman. I need to sleep. Can't sleep with all that racket going on. Now we are both curious. What's going on out there. It's fairly hard to see how much these kids have grown in the past month. I've put some pictures here (Ihope) that include people. That makes it easier to see their size. One thing you can get a glimpse of here is the red under kiwi's wing. Also some of these pictures should show skittles blue and purple a little better. Until last week they insisted on baby food. I think a lot of that was because of the attention that goes with the feeding. Yesterday they took to vegetables with a new enthusiasm. Today they attacked broccoli and pomegranate like their lives depended on it. I guess that in a sense it does. We think we can say that they are completely weaned now. Kiwi and Skittles have a house guest. Miss Betty said she came to visit us but I think she wanted to visit the birds. 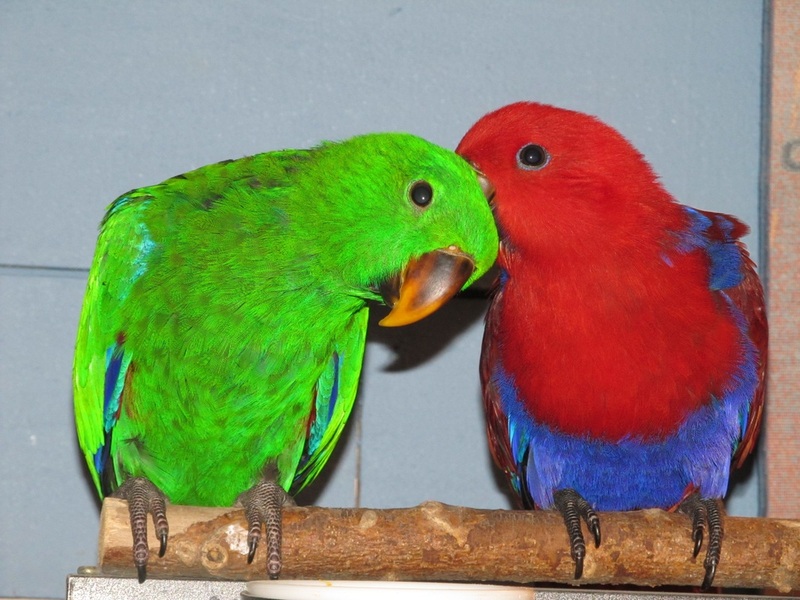 Birds hold onto a person with their feet but also with their beaks. Sometimes the colors look different from this depending on how the light hits them. But you can see Skittles blue accents here. This gives a good perspective on their size. I didn't realize that we had so little of kiwi and so many of skittles. Probably trying to keep Kiwi quiet. He is more gentle than skittles but today with all the excitement he decided he would bite my finger.....hard. He got a lot of time on the perch which is where he wanted to be. A well behaved bird sometimes acts different when strangers enter his surroundings. They are still learning. 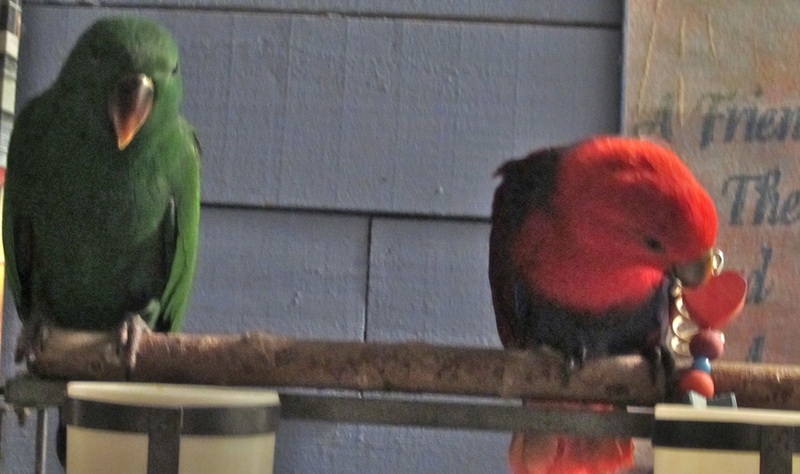 Two folks who are trying to become parrot farmers.